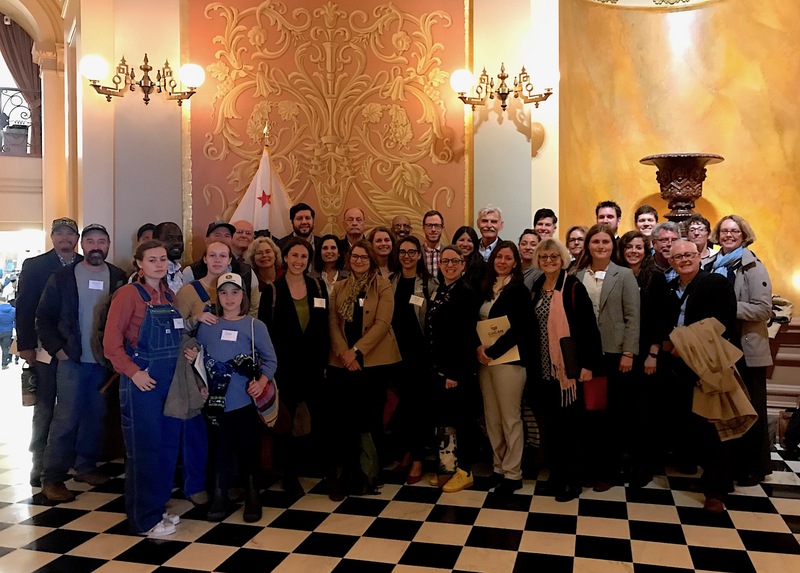 In March, farmers, ranchers and representatives from partner organizations and businesses from throughout the state came together with CalCAN staff in Sacramento to advocate for policies to invest in California producers and advance climate-friendly agriculture. As part of the annual CalCAN Legislator Education Day, our team of more than 30 farmers, ranchers and other partners met with 10 Senators and Assemblymembers, staff from another 14 legislative offices, and four state agencies and Secretary of the California Department of Food and Agriculture Secretary of Agriculture Karen Ross. delivering farmers’ perspectives directly to policymakers themselves. One of our teams from the San Joaquin Valley smiles for the camera after their meeting with a legislative staff member. In regional cohorts, the group shared stories with their elected representatives of farmers and ranchers benefiting from the state’s Climate Smart Agriculture programs. They described the many agronomic, economic, environmental and community health benefits that come with improving soil health, conserving water, adopting drier manure management practices on dairies and protecting agricultural land. Together, we brought stories from climate-friendly farmers and ranchers throughout the state directly to the doors of policymakers. 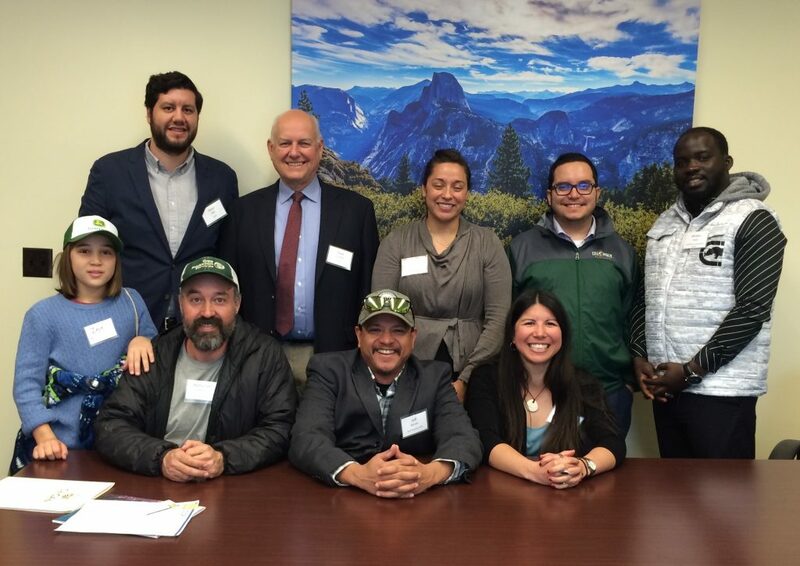 CalCAN partners also educated policymakers about the need for resources to support growers in facing the mounting challenges brought on by climate change. Our teams asked legislators to advance CalCAN-sponsored Assembly Bill 409, the “Ag Adaptation Tools” Bill authored by Assemblymember Monique Limón. Read more about the bill and how it would equip farmers with tools and resources to adapt to climate change. For CalCAN staff, this is always an energizing day as we listen to some of our core supporters share their perspectives and knowledge with their elected representatives. For many in the group, making their voices heard so directly in state policy was a first experience. The group left grateful to have been a part of a larger effort to make change, with a forward-looking eye for more opportunities to do so with CalCAN. The fact that so many partners were willing to travel to Sacramento and give a full day to this effort is inspiring. For CalCAN staff, it reminds us how impactful their voices are and what an honor it is to get to amplify them. We are grateful for the opportunity to build bridges from farmers, ranchers, and other partners on the ground to the state Capitol. We extend deep thanks to all who participated in the day. If you are interested in advocating with us in the future, please sign up for notifications about engagement opportunities to make your voice heard. If you represent a farm, ranch, organization or business, you can apply to become a member of the CalCAN Alliance. See the fact sheets we shared with legislative offices.